I have a Sony DG720 with some out of whack voltages on the UPC2581 preamp IC's. Pins 4 and 10 measure -55V where they should be +55V. This is on all four IC's - IC500, 600, 700, and 800. Also, there is about +3.5V on pin 1, on all of these IC's . The real puzzle? The unit works just perfectly! Very clean sound. EXCEPT -All preamp IC's run extremly hot. These normally do run very warm, but I wouldnt think so much so as to get burned fingers. I have checked and checked again and again, made sure all digital and analog grounds are OK. I know it can't be a schematic misprint because I had a DG520 that's identical (5.1 version) that I used to compare with - it had the proper voltages as per the schematic. 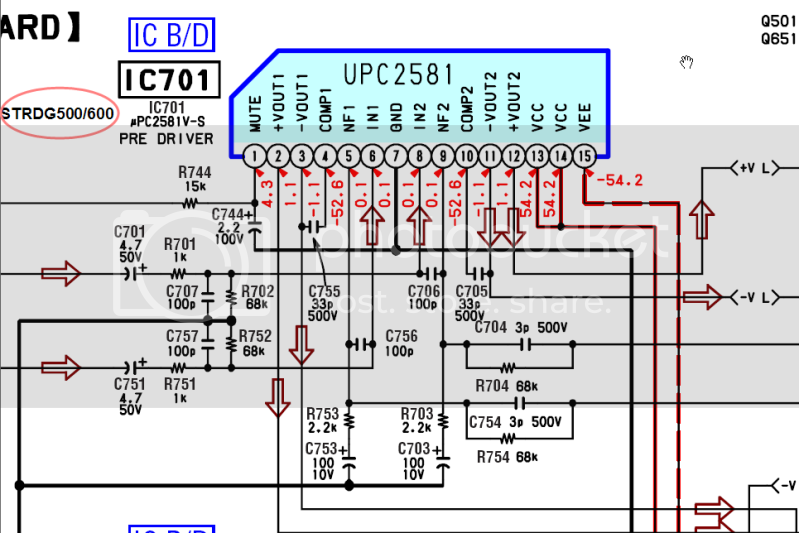 While I do not have the specific DG520 schematic, I can tell you that any of the Sony's that used the UPC2581 as a predriver, pins 4 and 10 are supposed to be sitting at negative Vcc NOT plus Vcc as they are just the compensating pins isolated by a cap. About 3.5~4 V is also normally read at pin1 which is a mute pin on the UPC2581.---and they do in fact run rather HOT to the touch. I have seen on some of the older models where it actually causes the nearby electrolytics to eventually dry out. 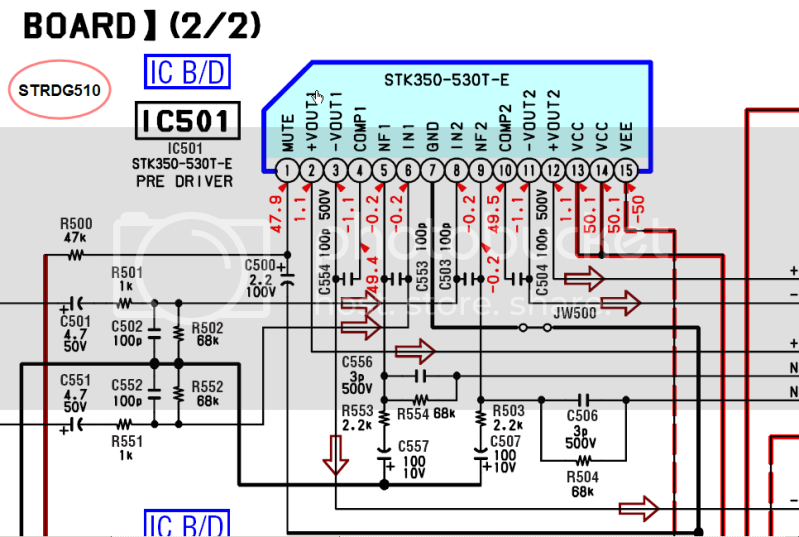 On the other hand, some used the STK350-530 which is also a 15 pin predriver similar to UPC2581 EXCEPT the compensating pins 4 and 10 are sitting at plus Vcc and about +Vcc on the mute pin. .... example STRDG500/600 Versus STRDG510. Thanks for the input, Vtech, much appreciated! hi, i was trying to measure Volt outputs on SONY DA50ES mainboard, and accidentally shorted the VEE to GRND, it has electric spark pop at once. the system is okay, but now the central channel almost gone, even i turn the vol to max, i can obarely hear the output. the preout for central channel also no Volt. More guides are coming. I think the next would be Toshiba Tecra TE2100.